Home>Music> GoldLink Accuses Lil Uzi Vert Of Stealing "DMV Flow" On New Song "Free Uzi"
Yesterday, Lil Uzi Vert shockingly came out of retirement by releasing a brand new single. "Free Uzi" displays the rapper spitting hard flows in a pitched-up tone. Many of his fans have been rocking with the new track since it came out yesterday. After all, it's one of the first times we've heard Uzi on a record since he released "New Patek" in the summer. The release was enough to get people excited for the eventual arrival of Eternal Atake, leading us to publish a list of five things we absolutely want from the project. D.C. rapper GoldLink wasn't entirely pleased after he heard "Free Uzi" though. In fact, he let off some steam on his Instagram story, accusing the Philly product of stealing flows from his DMV peers. GoldLink's post has since been deleted but he complained that while DMV rappers are struggling to be heard, Uzi is actively stealing their flows and using them on his new record. "Lil uzi really stealing the DMV flow and is finna make millions," said the artist. "While the lil n***as here starve for their originality." GoldLink is one of the few well-known artists from the area, with Rico Nasty breaking out as a major threat in the last year. Unfortunately, the area isn't given as much shine as Atlanta, a city that Uzi has focused on for much of his career. 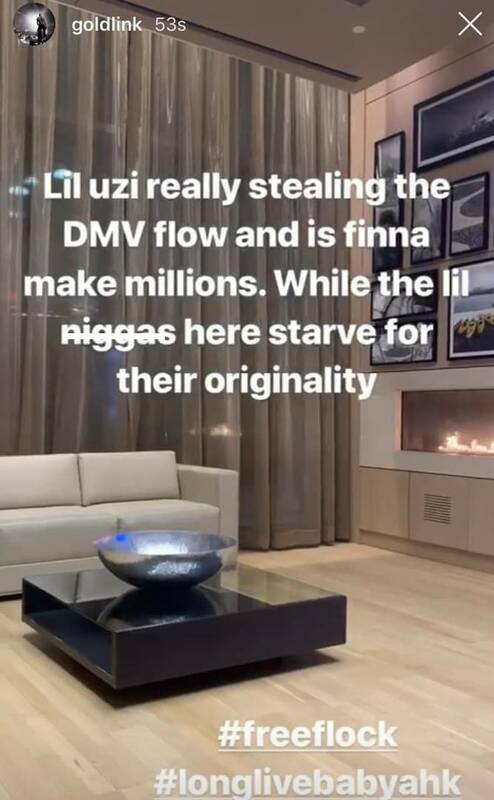 Do you think Uzi was biting DMV artists on his new track? Check out the screenshot below via RapCurrent. MUSIC GoldLink Accuses Lil Uzi Vert Of Stealing "DMV Flow" On New Song "Free Uzi"